The Carnegie Cotton Gin in Oklahoma is the very first to partner with PhytoGen in its new cotton promotion, the Yieldmobile. Jeannie Hileman, gin manager, says gin staff, members and producers are excited to participate in the fun advertising campaign to help promote cotton. The first-ever Yieldmobile recently rolled across the High Plains headed to Carnegie, Oklahoma. 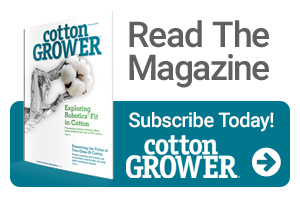 The Farmers Coop Mill & Elevator, known locally as the Carnegie Cotton Gin, is thriving along with cotton producers and PhytoGen® cottonseed in Oklahoma. “I’ve always been involved in cotton promotion and have fought for cotton acres in Oklahoma for years,” says Jeannie Hileman, gin manager, Carnegie Cotton Gin. 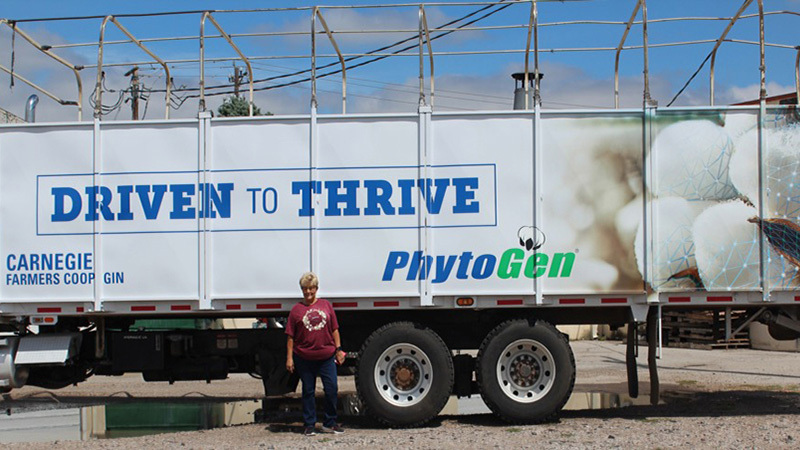 The Yieldmobiles are module trucks that recognize the gin while giving a nod to cotton producers and PhytoGen with the slogan “Driven to Thrive.” PhytoGen selected only a few gins across the country to participate in its new marketing campaign. “Any way we can promote cotton is good for the industry. This is exciting for us! It is a cool, fun project and the module truck wraps turned out really nice. It was an honor to be chosen to participate,” Hileman says. Carnegie Cotton Gin provided two module trucks that were wrapped with the artwork. The campaign works to build awareness of PhytoGen while supporting producers who value high-yielding, high-quality cotton. Anyone who sees the Carnegie Cotton Gin Yieldmobile can join in the fun by sharing the sighting on Twitter @PhytoGencotton or on PhytoGen Facebook. “Our board and our general manager, Tom Steinmetz, support new ways to promote cotton. This Yieldmobile program from PhytoGen is fun — and it’s helped us make the workplace more fun. All of our employees, especially the drivers, are excited about these spruced-up trucks!” Hileman says. Carnegie Cotton Gin is one of the largest in Oklahoma and has experienced tremendous growth the last few years. Oklahoma also is one of the fastest-growing cotton producing states and a strong supporter of PhytoGen. In June 2018, Oklahoma Upland cotton was forecasted at 720,000 acres, up 23 percent from 2017. For many years, weeds and worms had halted cotton production in the state. In fact, it took Hileman and the producers in the area until 2005 to break their gin record of 10,080 bales set in 1979. By 2016, they ginned 60,000 bales and then sky-rocketed to 123,000 bales in 2017. They were able to process the additional cotton thanks to the new gin they invested in last year. This year, they anticipate ginning more than 125,000 bales of cotton. Hileman herself is being recognized for her business acumen. While she wasn’t the first female gin manager at Carnegie, she is one of the first to make such a large impact throughout the ginning industry. She was recently named by the Oklahoma Department of Agriculture, Food & Forestry (ODAFF) as a “Significant Woman in Agriculture.” The unique program is a collaborative effort between the ODAFF and Oklahoma State University to recognize and honor the countless women across Oklahoma for their tremendous impact on agriculture in their communities. “If you want to fail, just look at your life for an excuse. But if you want to succeed, look around and you’ll see you have no reason not to succeed. If you want it badly enough, you’ll find a way,” Hileman says. That’s what the PhytoGen team calls “Driven to Thrive”! To learn more about PhytoGen, go to www.PhytogenCottonseed.com.